Monday is a very special day at the Shivoham Shiva Temple. 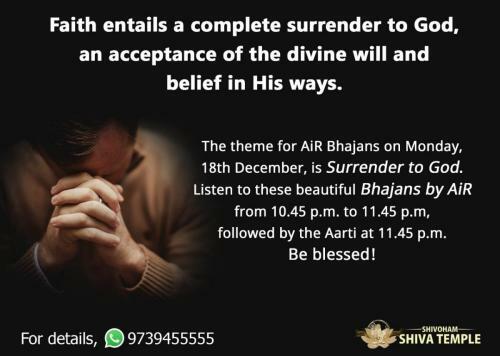 It is celebrated as the “Believers’ Day”. This day, believers come to the Shiv temple and connect with God. 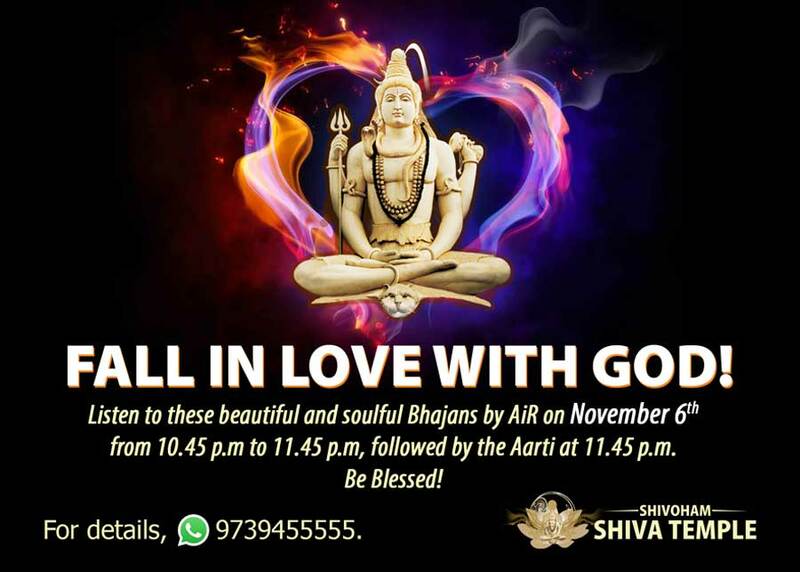 This auspicious day is dedicated to Lord Shiva or Bholenath as he is fondly called by His followers. 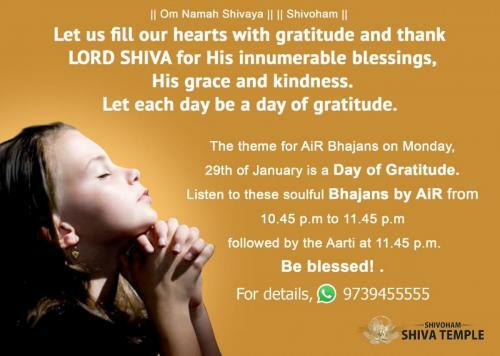 Many Shiva followers observe a fast on Mondays and devoutly pray to Shiva, knowing that He will listen to their prayers. 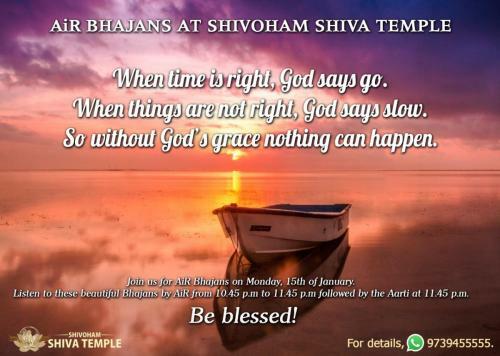 The Shivoham Shiva Temple is always buzzing with devotees, more so on Mondays, right from morning to night because of these very reasons. 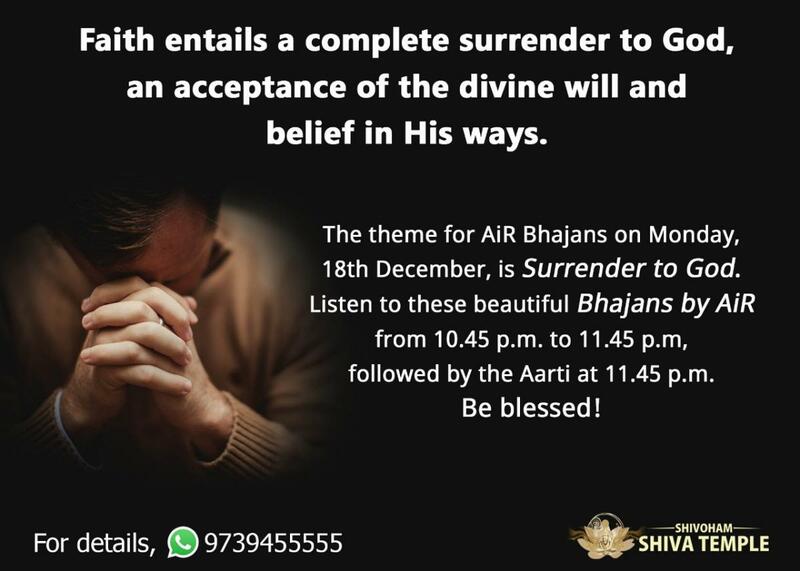 Right through the day, believers and devotees chant mantras, perform poojas and Ling Abhishek, undertake the Paanch Dham Yatra, the Barah Jyotir Ling Yatra at the temple, and engage in other spiritual activites offered by the temple, and seek the divine blessings of God. 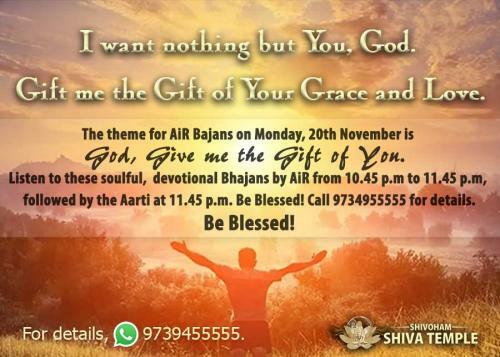 Every Monday night, from 10.45 p.m. to 11.45 p.m, devotees, visitors, guests can listen to Shiv Bhajans live at the Shivoham Shiva Temple. They can also join in and be a part of the Shiv Aarti at 11:45 P.M. 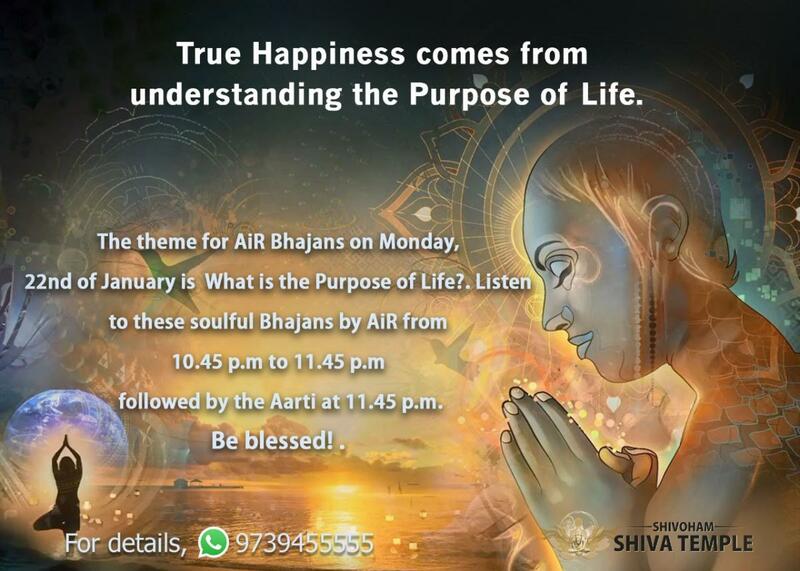 Following the aarti, prasadam is distributed to everyone present. The Shiv Bhajans are sung live by AiR, the founder of the Shivoham Shiva Temple. 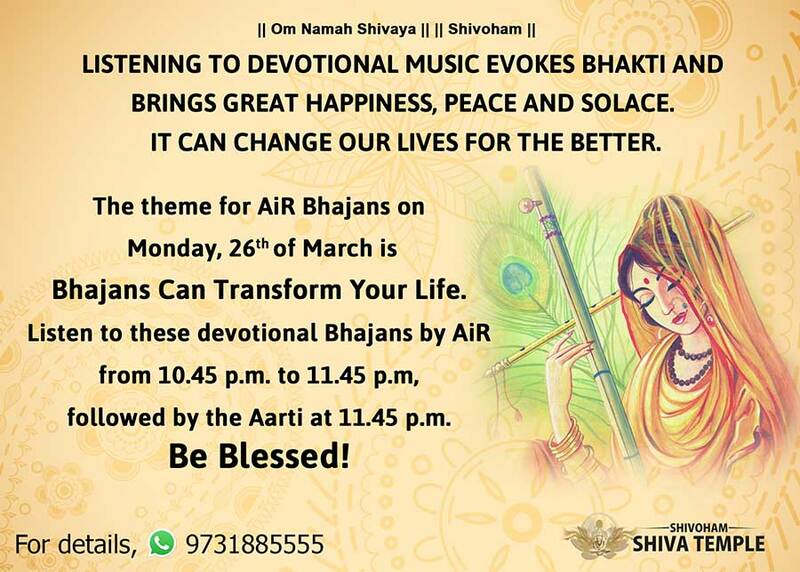 AiR has also composed many bhajans. Every Monday, for Believers’ Day, a specific “Spiritual Theme” is chosen. 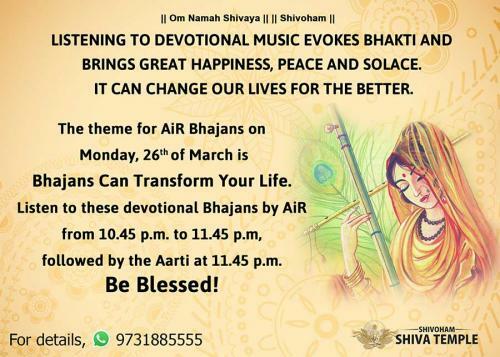 Bhajans based on that certain theme are sung by AiR. 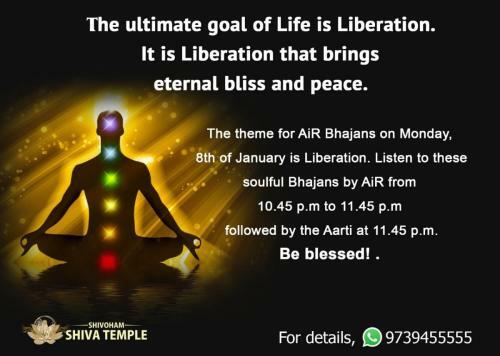 The temple resonates with the sound of music and the soul-stirring words of the Bhajans, creating a magical atmosphere and enthralling the devotees. 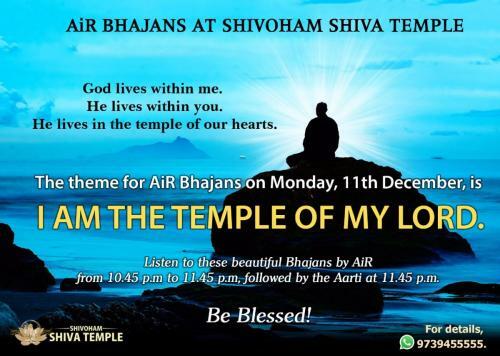 The Shivoham Shiva Temple encourages all devotees, followers and believers to visit the Shivoham Shiva Temple on Believers’ Day every Monday to experience the strong spiritual vibrations at the temple, which strengthen faith and will further help them on their spiritual journey and take them on the path to become seekers from believers.